April 03, 2019: BSER Matric Result 2019 - Bihar School Examination Board (BSEB) conducts the Bihar 10th exams every year for lakhs of candidates, both regular and ex-regular. This year too, BSEB successfully conducted the Bihar Board Matric exams from 21 February to 28 February, 2019. The exams held over a period of one week and then the BSEB 10th results can be expected to be announced by the month of April, 2019. Since the Matric exam will be first big exam for Bihar Board students, the BSEB has decided to start the tele- counselling session for the students in order to avoid any cionfusion or tension regarding the exam. For more information on the BSEB Bihar Board Result dates For more information on the BSEB 10th Results 2019, and Bihar Class 10 Time Table 2019, keep visiting our website. The Bihar School Examination Board (BSEB) also conducts the Bihar Intermediate Board exams every year. 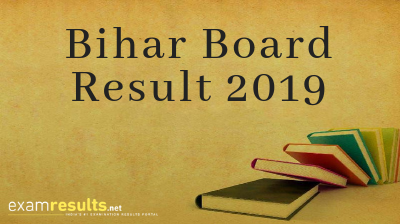 Bihar Board intermediate result 2019 to be declared on 30th March The Bihar Intermediate Board exams 2019 was held from 6 February and till 16 February, 2019 for Arts and Commerce streams and February for Science stream. A 24x7 control room has been set up for Bihar Inter exam candidates in order to help them with seating arrangements, queries related to exam papers and other necessary issues. A WhatsApp group called Bihar Board Exam 2019 has also been made to share information about the Bihar Intermediate examination. Students are advised to visit our website for more information on Bihar Board 12th Results 2019 i.e.Bihar Board result 2019 and Bihar Class 12 Time Table 2019. How to Check Bihar School Examination Board Result 2019? Going by last 2 years trend the BSEB 10th results can be expected by the end of April, 2019 and for Bihar Inter results, it can be expected in the month of June. Given below is the last 3 years’ Bihar Board exam result analysis in tabular form. We will update this table with the pass percentage for 2019 once the results for this academic year are out. As seen in the given table the pass percentage in 2016 for Bihar Board class 10 was 46.66% and in 2017 the pass percentage saw a rise by 4% and was 50.12%. In 2018, the overall passing percentage for 10th was 68.89% and for 12th, it was 52%. It is expected that this year the overall pass percentage will be more than 50%.The pass percentage in 2017 for Bihar Board class 12 was 35.25% It is expected that this year the overall pass percentage will be more than 50%. Where Else To Check BSEB Exam Result 2019? You can check your BSEB Matric Class 10 Results 2019 and BSEB Intermediate Class 12 Results 2019 from www.examresults.net website along with the official website of Bihar board biharboardonline.bihar.gov.in. Once you are done with checking the Bihar Board Result 2019: BSEB 10th (Matric), 12th (Intermediate), you will also be provided with the option to download a softcopy / PDF copy of your scorecard. The students can also opt to preserve physical copies of Bihar Board Result 2019 by taking a printout from the official website. These downloaded / printed copies of BSEB Matric Result 2019 and Bihar Board 12th Result 2019 can be used as provisional results until the official mark sheets are issued by the Board. After the declaration of Bihar Class 10 Result 2019 and Bihar Intermediate Result 2019, students can apply for rechecking or revaluating of answer sheets by paying a nominal fee. The detailed procedure for this can be found on the official board website. The Bihar School Examination Board (BSEB) announces the Bihar Matric Results i.e. the Bihar 10th Result every year on the basis of the Matriculation (Class 10) Examination. The Bihar Class 10 Results 2019 forms a very important part of the career of a Class X student as it decides in which stream of education he/she will pursue the Class 12 education.